The stormwater code is designed to protect people, property, and the environment by controlling how rainwater runs off of streets, buildings, and parking lots. 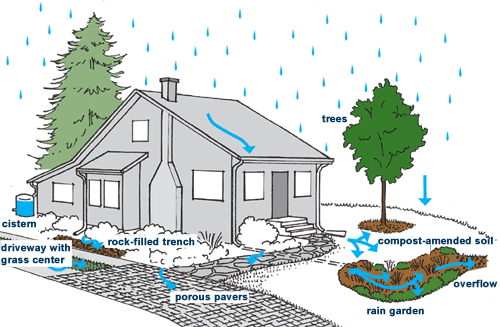 Stormwater runoff can cause flooding, landslides, and erosion, which in turn can damage homes, businesses, and property. It also carries oil and grease, fertilizers, pesticides and other toxic chemicals to creeks, lakes, bays, rivers and other waterways. Some examples of storm water mitigation techniques. Cistern system overflow into raingarden. 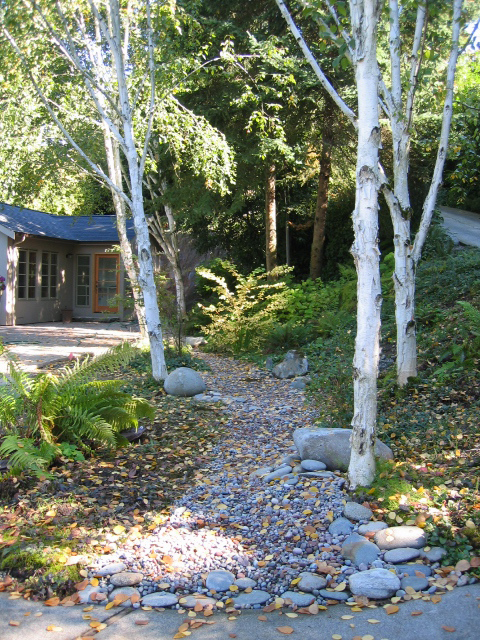 Raingarden captures runoff from driveway and hardscaping. Raingarden and overflow facility captures stormwater from public sidewalk. Most APLDWA members practicing in Seattle, and other Western Washington jurisdictions, will be affected by new regulations on single-family and small multi-family projects. 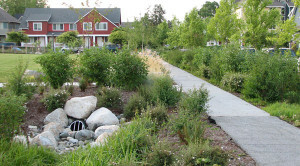 As these new codes are implemented in Western Washington over the next several years, APLDWA members are encouraged to seek out training opportunities on stormwater management and LID techniques in order to stay abreast of the current technology and requirements. 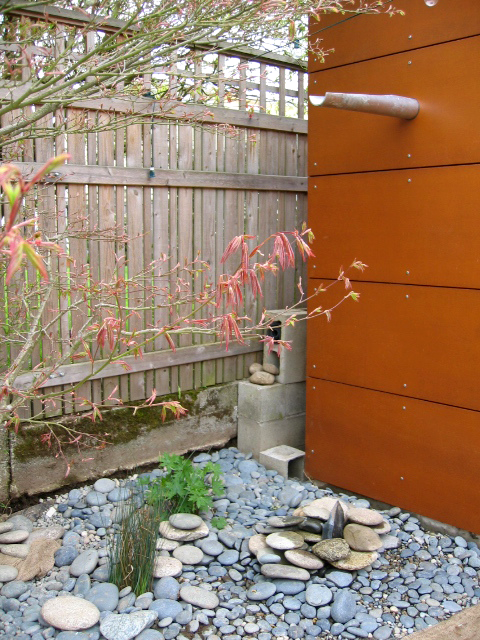 For example, in Seattle, some type of stormwater management technique will soon be required for any new single-family residential construction [or remodel] of over 2,000 square feet of impervious surface. There will be a stepped checklist of preferred remediations. The following methods of onsite stormwater management must be evaluated for feasibility in order by category. Category One includes: 1] full dispersion, 2] infiltration trenches, and 3] dry wells. If none of these is feasible then the next category must be evaluated, and so on through the four categories (total of 17 options). The City is now in an informal comment period on the initial draft. After this informal comment period closes at the end of July, the City will revise the initial draft and submit it to the DOE. After its review the final drafts will be available for formal public comment, anticipated in the winter of 2015. Members of the Advocacy Committee have attended informal presentation and feedback-gathering meetings hosted by the City of Seattle. We are monitoring Seattle’s process and providing feedback when necessary. And, Vanessa Gardner Nagel, APLD, has been attending pubic hearings and providing feedback for over a year on the process in Cowlitz County. 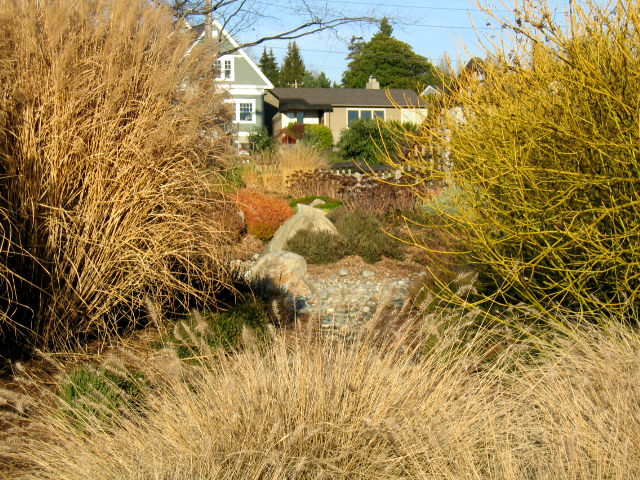 Stormwater management is a hot topic in many regions of the nation (Midwest, California and Eastern seaboard) and in other areas in Washington State. It will continue to impact our designs—whether mandated by code or by us as we create designs that result in more sustainable landscapes. I encourage members who encounter an unfamiliar code pertaining to stormwater to inform the Advocacy Committee so that we can continue to monitor changes throughout the region. The website for Seattle’s update is http://www.seattle.gov/dpd/codesrules/changestocode/stormwatercode/whatwhy.